Back again with fast food event series . This month is special for Poha /Flattened rice / Aval . 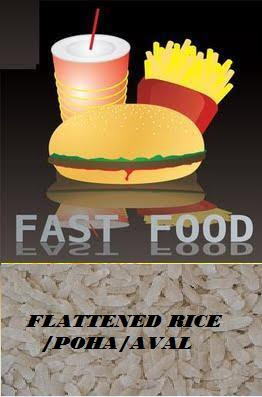 1) Cook any healthy recipe with flattened rice/poha/aval both Vegetarian and Non-Vegetarian . Post it in your blog and link it back to the event . 4) Waiting for your lovely recipes only. Great ingredient - If i do something i will keep in mind ur event. Happy hosting and I will surely post my recipe. Hey, thanks for stopping by in my blog..you got a nice collection of recipes. Hey Shama, today only I come to know about your lovely event. Please check my recipe poha pulao. Happy hosting dear. Happy to see same layout of my blog. Posted poha Kozhukattai. Happy to follow you will be glad if you do the same.